Those Ancient Greeks knew a thing or two about mythology didn't they? All those monsters and mutants leaping about chopping each other into little pieces. Brilliant. And of course, ruling over all the monsters and mutants was Satan. Except he wasn't, 'cos the Greeks didn't believe in Satan. They had enough trouble from all the grouchy gods up on Olympus, never mind having to put up with Ol' Nick. Still, whether they believed in him or not, for the purposes of this game Satan does exist. And what's more, he's taken over the world. Gasp. Yes, Satan has taken over the four planes of existence and posted tons of his smeggy minions in them to keep it that way. Looks like a job for one of those lone hero types. Luckily, Greek mythology is bursting at the seams with lone hero types so it's pretty hard to moan about how only one bloke has been sent to do an army's job. That's the way the Ancient Greek did things you see. Something to do with honour I suppose. Personally, I'd rather just "send in the boys" than hack and slash my way through countless demons and spooks, but then I'm a bit useless at things like that. Perseus on the other hand, is great at the old hacking and slashing, so it's time that you control. 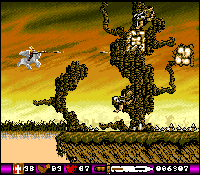 As you fly through the first level, astride Pegasus, the enemy zoom in to attack in fairly predictable patterns but their sheer volume prevents it becoming too easy. You fight back with fireballs from your sword, which can of course be upgraded by collecting enough cash. Cash comes in the form of diamonds, which are left behind when a wave of baddies are destroyed. The graphics are very scrumptious indeed, with plenty of colour, lightning flashes, bucket loads of parallax scrolling and some incredible animation on Peggy himself. 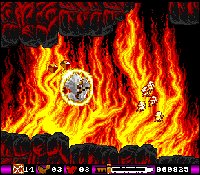 As the levels progress, the background graphics become more and more dazzling, right up to the swirling flames of Hell. The sound is well suited to the game, as thunder punctuates the explosions and "zap" effects. It all adds up to a pretty impressive introduction ot the game. Once you've flown around for a bit, Pegasus dumps you on the ground and bogs off for a bit. This leads into what we in the business call the "walking around levels". The "walking around levels" are just as impressive as the flying bits. Perseus leaps and chops away at all manner of bogus beasties, ranging from scorpions to killer turkeys, with all the enthusiasm of an NME reader with a hammer in a room of MC Hammer records. Every now and then you'll come across something bigger, like a massive, drooling, blood encrusted hell hound. As you can probably understand, these fellas take a right pasting before they sod off. Along the way you'll also discover secret levels full of lovely diamonds, and paths under and over the various hazards that face you. So, it's a scrolling shoot-'em-up, it's pretty good, and, er, that's it. On balance I'd say that Pegasus has the edge over Thunder Jaws for two reasons. One, it's a lot nicer to look at and the graphics have obviously had a lot of work put into them and two, it's that little bit faster and smoother which in turn makes it a smidgeon more playable. If you're thinking of buying a shoot-'em-up this week, then you could do worse than to splash out on a copy of Pegasus. Very pleasant indeed. Some great animation, plenty of neat touches and truly beautiful backdrops. Not a bad tune, and some effective FX. Everything is smooth and it plays like a dream. As addictive as any shoot-'em-up can ever be. Straight out of Clash of the Titans, Pegasus, the winged horse, is your trusty steed who will help you make your way through the five planes of existence and rid the ancient worlds of Satan's hold and his horde of abominations of nature. Chan the Sorcerer had a vision of a brave warrior on a winged horse traversing the five worlds to reach the ultimate goal: the defeat of Satan. Perseus, by some mystical coincidence, ha d a similar vision, though in his dream, it is he who is the warrior riding Pegasus. Perseus has travelled to Chan's castle, where the Sorcerer has prepared the magical winged horse Pegasus, and distributed as much magic as he could across the four planes. Desert Swamp, Ice and War to help the two Pees along the way to the fifth plane, Hell. The game is played on a horizontally-scrolling world, across the five planes. Each of the levels is split into five smaller stages. On each of these stages, there are two styles of play. The first part of each stage sees Perseus mounted on Pegasus, flying through the air, in combat with various airborne nasties and some other creatures on the ground. The next part of the stage has Perseus on foot, making his way through a barrage of Satan's mutants all with the sole intention of stopping Perseus in his tracks. Gameplay on both the stages is similar - shoot anything that moves, the only real difference being the change in controls. While you shoot the hordes of attacking mutants, you are rewarded with a crystal. Collecting crystals entitles you to better weapons, an extra life, or more energy on the running stage, depending on how many you collect. This weapon upgrade and exchange is almost standard in games nowadays, to the extent that is is almost cliché. What is peculiar is being able to upgrade to laser-like weapons, especially because this game's set in Greek mythology! Then again, the end-of-level guardians are pretty mean beasts, requiring some mega hefty fire-power to overcome them, so the power-up pulse lasers come in very handy. The game can easily become tedious: progressing through the 50 levels reaps little reward, there is little incentive to carry on to reach the last plane. Hell (except to defeat Satan, of course). Even getting this far can be difficult. The game is not easy, and it doesn't help that the game is a bit monotonous, without much variation from level-to-level to keep you interested. Thankfully, Pegasus does have a password facility, which ever 10 levels (at then end of the current plane after you have defeated the relevant guardian) you are rewarded with, so you can continue play at the world where your last game finished, without driving you to absolute insanity having to start from the beginning. Graphically the game is nothing special, with colourful but uninspiring graphics. Character animation is good, with a nice flow, but the parallax scrolling is uneven, with an unpleasant jerky display, making the effect look quite poor. The sound is quite good though, at least on the introduction sequence where there is a pleasant piece of music. In game sounds are restricted to sound effects although these are of a good standard. It's a good game, but not very original - this particular game style has been around for years, and no doubt will continue to be. You could easily say 'seen it done it' - there is an ocean of similar games out there. The horizontal scroller format is very popular, and combining it with a platform-style game is novel, but not inventive enough to take this game up out of the mediocre. Colourful graphics, if a bit blocky. Game is easy to control, but can get difficult in places. Little variation from level to level makes game a bit repetitive. New approach to an old style. Bei Gremlin hatte wohl jemand seinen kreativen Tag, als nach einem Helden für das neue Bumbumspiel gesucht wurde: Nicht als Raumpilot, nicht als Miniatur-Rambo, nein, als Reiter des geflügelten Dichterrosses der Antike sorgt man hier für Recht, Ordnung und gegnerfreie Screens! Der "Rest" ist dann allerdings wieder ein recht bodenständiges Actiongame der horizontal scrollenden Sorte. Von der Vorgeschichte ist eigentlich nur soviel interessant, als es diesmal gegen Satan höchstpersönlich geht; der wartet denn auch zum Schluß in seiner Hölle auf den Spieler. Doch bevor man dem Beelzebub die Hand schütteln darf, sind erstmal 50 Level voller Pferdehasser zu bewältigen, die in fünf verschiedene Welten aufgeteilt sind: Gebirge, Sumpf, Eislandschaft, Wüste und eben die (Kriegs-) Hölle. Dabei wird übrigens nur die Hälfte der Zeit geflogen, denn zwischendurch will sich der Pegasus-Reiter auch mal die Füße vertreten. Darüberhinaus sprüht das Leveldesign nicht gerade vor Einfällen, die meisten Gegnerformationen kennt man schon von irgendwoher, und daß man Schlüssel und Kristalle aufsammeln muß, soll bei anderen Spielen ja auch schon vereinzelt vorgekommen sein. Dafür gibt es am Ende eines Abschnitts nicht nur den obligaten Obermotz, sondern auch ein Paßwort. Die (Extra-) Waffenauswahl ist beachtlich, bloß daß die Smart Bombs sofort nach dem Aufnehmen explodieren, spricht nicht unbedingt für die Programmierer. Im übrigen ist die technische Umsetzung aber gut geglückt: Feine Grafik mit feinem Mehrfachscrolling, feine Musik und fei... öh, durchschnittliche Effekte. Spezialität: Highscores werden nicht gesaved, Codeabfrage aus der deutschen Anleitung. Two things are obvious about Pegasus right from the off. One, this game was never really designed to be the pinnacle of Amiga software, and two, the scenario is complete hogwash. Instead of giving you a whole load of headaches about lands ravaged by evil, and the good wizard Chan, then, (I'm sure you can guess most of it) I'll get down to the business of actually reviewing the thing instead. Hey, ho, here we go. 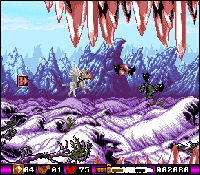 Pegasus is primarily a right-to-left scrolling blast through five distinct lands (desert, swamp, ice, war and hell), each ten levels in length. Nothing outstanding so far. But its trump card is the fact that these levels alternate between a flying sequence (where you're mounted on a flying horse of course, hence the title) and a platform-ish running and sword swinging bit. So for the money, Gremlin give us an Nemesis/R-Type variant and a Black Tiger sort of affair. And though neither level is really spectacular enough to stand up on its own, put together they offer an intriguing proposition. Despite the pretensions to mythology and the olde worlde scenery, this is a game of power ups and wave upon wave of attackers. Shoot-'em-ups like this stand and fall on how well the attack waves have been designed, and despite the fact that it's been improved since we first saw it, there's still too much looseness about the ideal. There's not really enough strategy involved in the way you move, and the nasties are just to small and fast to be massively avoidable. The fact that a number of collisions are allowed before a life is lost reinforces the feeling that progress is more a matter of luck than joystick skill. Although the most simplistic, the platform level is probably the most fun. Not only does the landscape scroll, but a flip-screen system is used for vertical movement, giving more of an arcade-adventure feel (though movement is always to the right, so it's not as if there's much exploring to be done). Compare this sequence though (with its incredibly poor sword-fighting system) to First Samurai's sword-swinging antics and it starts to look more than a little bit dated. And yet, Pegasus does offer a fair amount of enjoyment. 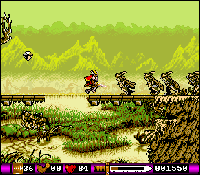 The beautiful backgrounds are worth persevering for, the scenery for the Hell levels being particularly outstanding. And the limited continue facility is a boon. But in the end Pegasus feels more like a pot-boiler than one of Gremlin's premier products. I guess not every game can be a real corker. Perhaps if Pegasus was a fiver cheaper then I could recommend it. For this sort of price though, simplistic arcade games such as this just don't cut it. With its stunning parallax and minimal gameplay, Pegasus is set to join the 'Dragon's Lair School Of Stunning Aesthetics And Little Else'. Split into two distinct game-styles, Pegasus cartainly has promise, but the severe lack of variety within its fifty practically identical levels means that it can hardly challenge the likes of R-Type II and Denaris in the shoot 'em up league. Cast as a brave Knight out to liberate his world from an evil Demon, players must battle their way across the horizontally-scrolling levels, killing anything that gets in the way. The twist, though, comes in the Knight's form, of transport which, as the title suggests, is the mythical flying steed. Thus, seated upon this noble creature, the player must guide the horse through the many attack waves, dodging the enemy attack waves, loosing off deadly energy bolts to clear a path and collecting the assorted power-ups that are left behind. However, every other level, the Knight dismounts for a little Black Tiger-style sword-play and platform tomfoolery. 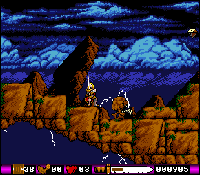 Switching between these two styles, the only major changes are in the backdrop graphics after every ten stages, and the occasional appearance of a larger creature. Now this wouldn't be too bad if only the actual levels themselves were interesting. Unfortunately, though, the attack waves are predictable and appear in limited formations, whilst the platform sequences are only made taxing with the addition of moving ledges and seemingly-impassable chasms. As you can tell, I'm not exactly enamoured with Gremlin's latest, and it just doesn't measure up to the likes of Switchblade II and Lotus II. If that much-needed boost of variety had been incorporated then Gremlin would be on to a winner, but, as it is, Pegasus is dull and repetitive fare.